Preparation Methods & Dosage :Leaf teas, cough syrups and drops. Extracts. For treatment of gastrointestinal upset, take thirty minutes before eating. The bitter taste activates the healthful actions, don't overdo adding sweeteners. In the Kitchen: Horehound is a favorite to use in oldfashioned cough drops recipes. Horehound Side Effects: Horehound should not be used by pregnant women, nursing mothers, very young children or the elderly. Leaves:Densely packed green leaves with white edges on a single stalk. The leaves are much wrinkled, opposite, petiolate, about 1 inch long, covered with white, felted hairs, which give them a woolly appearance. 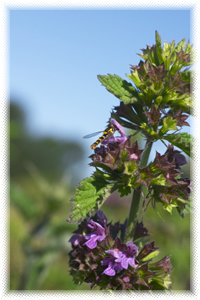 Horehound is a perennial hardy to Zone 3 here in North America. It prefers full sun and well-drained soil. Once established, horehound required very little additional water. Bees love the blossoms. 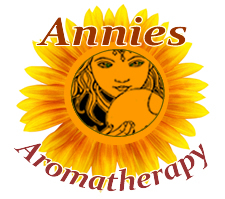 Harvest leaves and flowers during the growing season to use fresh, and dry to used during winter months for cold and cough season. The Egyptians and Romans esteemed Horehound for coughs and colds, the same uses as it is recommend by modern herbalists. 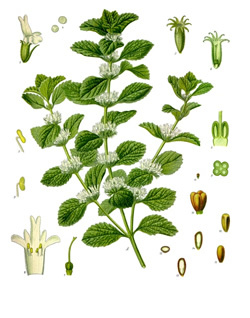 For centuries white horehound has been traditionally a reliable liver and digestive remedy. The plant has also been used to reduce fevers and treat malaria.This is one of the bitter herbs ordained to be eaten at Passover supper by the Jews. Gerard also recommended it as an antidote for posions and for "mad dogge biting". 1. Until 1900, horehound was an accepted medicinal in the U.S. Pharmacopoeia and was found in various over-the-counter nostrums, including cough drops. In 1989 FDA challenged its use for a supposed lack of efficacy. A year later, Germany's commission E endorsed horehound's folk reputation as an effective treatment for coughing, colds and indigestion. Decide for yourself.